iTWire – 'No excuse' for poor customer service | The Taylor Reach Group Inc.
Delivering poor Customer Service is a choice organizations make, by failing to back up their words with the required financial commitment and #custserv leadership and expertise. 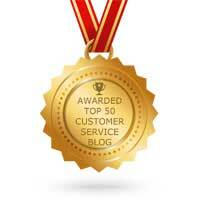 Winner Top 50 Customer Service Blogs! Friction in the Contact Center | The Taylor Reach Group Inc.